Explore the historic Church Hill area by Segway tour and explore notable sites on this 2-hour tour. Church Hill is known as the site of Virginia's second revolutionary convention, where Patrick Henry gave his "Give me liberty or give me death" speech in St. John's Episcopal Church. Step back in time on this tour experience various parts of History! 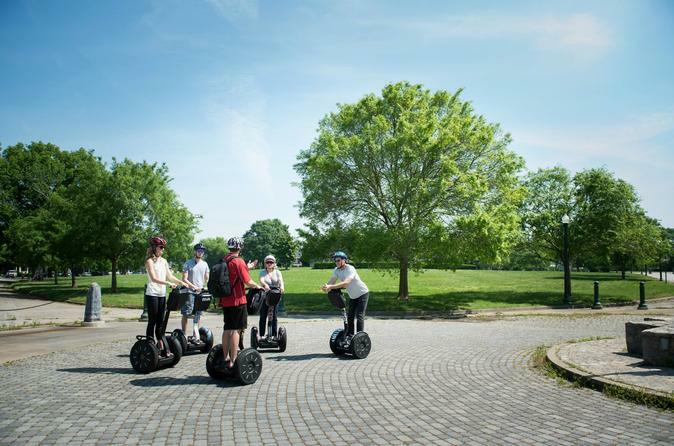 On this 2-hour segway tour of the historic Church Hill area of Richmond., you will be lead by a professional guide that will take you on a Journey through a beautiful area of Richmond. Among the highlights you will see are the site of Libby Prison, which was a confederate prison during the American Civil War that had an infamous reputation for the overcrowded and harsh conditions under which officer prisoners from the Union Army were kept. Then you will experience Libby Hill which is located on the southeastern section of Church Hill, overlooking the James River, this area will provide beautiful views of the river for you to take photos. The Masonic Lodge that George Washington and Lafayette visited that is the oldest operating lodge in the country and where Patrick Henry gave his famous "Give me Liberty or Give me Death" speech as well as Chimborazo Park, site of the largest war time hospital in history. Throughout this amazing journey, you will see incredible Iron fencing along with some of the oldest and most beautiful homes in the city, as Richmond is only second to New Orleans in iron works and fencing.